Scientific advancements have dominated much of the 21st century, making it impossible to ignore the ethical implications of advancing genetic procedures. In 2017, the United States spent a whopping 518 million dollars on genetic research alone. Unsurprisingly, new advances in these fields often reach far beyond the scope of existing ethical and legal regulations. This is a dire but often understated problem: rampant, unrestricted genetic engineering projects can threaten both public health and social equality. Thus, the international ratification of a robust, consistent set of genetic engineering guidelines is critical to the safe and ethical advancement of the technology. Much of the lingering fear surrounding genetic technology stems from current trends of healthcare inequality. Healthcare disparity between the rich and the poor is already tangible when considering that life expectancies vary by as much as 20 years between affluent and poor areas within the U.S., according to a recent study by the University of Washington. Although costs tend to fall as technology and medicine becomes more accessible, price drops do not equate to universal accessibility. One needs to look no further than IVF, which can still cost an upwards of $12,000 for a single procedure. ,Since medicine in principle should work towards bettering the health of all, the challenge lies in developing a regulatory framework that would expand availability to all socioeconomic class, not just the wealthy and powerful. Moreover, wealthy, developed nations enjoy a greater level of medical advancement, which raises the question of how genetic procedures have the potential to accelerate global health inequality, further aggravating geopolitical power imbalances. Global health inequality is already at a critical state. According to the World Health Organization, the risk of a child dying before turning one was over six times higher in Africa than in Europe. The number of clinics and costs for genetic procedures vary dramatically between countries as well; for instance, in Austria, insurance covers two-thirds of IVF costs, and prices average $3600 per cycle—almost one-fifth of that in the U.S. Similar statistics exist in European countries where universal healthcare is guaranteed. Consequently, the plurality of global healthcare structures hinders the drafting of an internationally binding set of regulations, as the availability of such technologies, and hence the social ramifications, would vary for each nation. A New Era of Eugenics? Accordingly, there is concern that genetic engineering could drive discrimination against unmodified and new forms of societal imbalance. This fear is historically justified; we have witnessed the genocidal aftermath of Eugenics programs not only in abroad in countries such as Japan, Sweden, and Nazi Germany but even in our own backyard. Peaking in the 1920s to 30s, the US Eugenics movement promoted the elimination of "negative" traits on the basis of race, disability, promiscuity, and criminality. A frightening parallel arises with genetic engineering. When the inherent biology of an individual can be altered, concerns arise as to whether some lives can be engineered to be more valuable than others. If genetic engineering remains unregulated , individuals without modifications may come to bear the burden of hearing society announce that their "undesirable traits" diminish their worth. In a nation that supposedly embraces individual differences how would people feel if certain traits were endorsed as “less than others"? Yet, in the process of creating a regulatory framework to address these issues, another major ethical obstacle emerges: if regulations are to limit unnecessary modifications as an attempt to prevent social stratification, who will decide which procedures are necessary and which are not? For instance, a genetic procedure to strengthen one's immune system may not be “necessary" in the short term but still a medical operation that may prolong life later on. Ethical lines will become further blurred once society accepts certain wishes of IVF mothers over others. What warrants a modification preventing phenylketonuria to be permissible, as opposed to procedures promoting muscle or immune system strength? A prominent challenge in crafting regulations is that these genetic advancements now are part of a globalized world where technology travels. The inconsistency of each country's guidelines for dealing with genetic technology is shocking. Out of 192 countries, 133 nations were reported to lack any sort of regulation relating to genetic modification technologies according to a 2009 UN report. Regarding germline genetic modification, in which altered traits can be passed down to future generations, most countries in Europe, as well as Canada and Australia have banned the procedure. On the other hand, countries such as China and India tend to have laxer policies concerning the technology, often lacking concrete statutes. Furthermore, standards for what is deemed safe in each country tend to diverge as well. For instance in 2015, the United Kingdom became the first and only nation to legalize mitochondrial replacement therapy, an operation that has not been explicitly approved by any other country. Undoubtedly, an international regulatory framework regarding genetic technologies is necessary now more than ever. However, a multitude of questions arise as to how we would ensure a democratic process to take place while establishing such a framework. With the vastly different stages of scientific development around the world, which countries should have a greater say in the process? Moreover, which culture's ethical system should be employed as the basis for crafting these regulations? With these ethical considerations in mind, a need for international discussion and consensus on such regulations is clear. Dialogue must be organized through the United Nations to incorporate as many countries as possible, and strict governmental adherence is required on a global scale. Because countries have already achieved varying levels of technological advancement, the insight of scientists holding the most current knowledge is imperative for proper discussion. Most importantly, in order to limit issues of power imbalance, it is necessary not only to share information amongst all nations regarding already established genetic procedures, but also to individually consider the technology's long-term ramifications in developing and developed countries. Though it may be tempting to advance this new technology as far as we can, we must realize that genetic engineering may come at significant societal costs that may not be fully recognized until it is too late. We don't want another Eugenics movement on our hands—especially not one based on genes that can be purchased. “NHGRI FY 2018 Congressional Justification." National Human Genome Research Institute (NHGRI. Berg, Paul. "Meetings That Changed the World: Asilomar 1975: DNA Modification Secured." Nature News, Nature Publishing Group, 17 Sept. 2008. Kamel, Remah Ma. 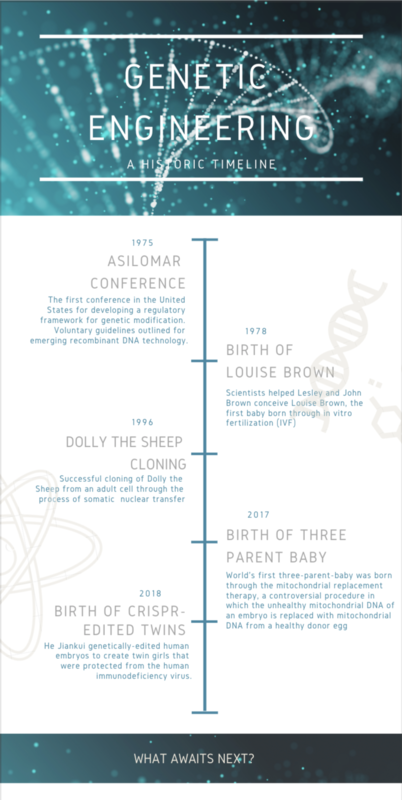 "Assisted Reproductive Technology after the Birth of Louise Brown." Gynecology & Obstetrics, vol. 03, no. 03, 2013. Scutti, Susan. “First Baby Girl Born Using Controversial IVF Technique." CNN, Cable News Network, 18 Jan. 2017. Luscombe, Richard. “Life Expectancy Gap between Rich and Poor US Regions Is 'More than 20 Years'." The Guardian, Guardian News and Media, 8 May 2017. Employee. “IVF Costs - In Vitro Fertilization Costs." IHR.com - IVF Costs, In Vitro Fertilization Costs, Invitro Fertilization Costs. “Infant Mortality." World Health Organization, World Health Organization. “Fertility Treatment: Global Trends." Nordfertility Clinic. Kobi. “Home." IVF-Worldwide.com Is the Largest and Most Comprehensive IVF Unit Directory in the World - IVF-Worldwide. "Eugenics." New Dictionary of the History of Ideas, Encyclopedia.com. “Unwanted Sterilization and Eugenics Programs in the United States." PBS, Public Broadcasting Service. Ardekani, Ali M. “Genetic Technologies and Ethics." Journal of Medical Ethics and History of Medicine 2 (2009). Schaefer, G Owen, and National University of Singapore. “Future - China May Be the Future of Genetic Enhancement." BBC, BBC, 8 Aug. 2016. Macer, Darryl R. J., and Baoqi Su. “Chinese People's Attitudes Towards Genetic Diseases and Children with Handicaps." Law and Human Genome Review, vol. 18, 2003, pp. 191–210. Brown, Kristen V. “Do We Need an International Body to Regulate Genetic Engineering?" Gizmodo, Gizmodo.com, 18 Jan. 2017. Palacios-González, César, and María de Jesús Medina-Arellano. “Mitochondrial Replacement Techniques and Mexico's Rule of Law: On the Legality of the First Maternal Spindle Transfer Case." Journal of Law and the Biosciences 4.1 (2017): 50–69.